A perforated eardrum (tympanum perforation) is an opening or rupture in the eardrum (tympanic membrane), the thin membrane that separates the outer ear canal from the middle ear. A perforated eardrum may be caused by infection, trauma, or negative pressure from underwater diving or an airplane flight. The hole or rupture can cause temporary hearing loss, pain , and occasional discharge. The eardrum (tympanic membrane) is a thin, semi-transparent membranous wall that stretches across the ear canal and separates the outer ear from the middle ear. The side that faces outward into the ear canal is covered with skin and the inside is covered with mucous membrane. The eardrum vibrates when sound waves travel into the ear canal and strike it. 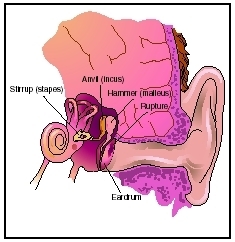 One of the bones of the middle ear (the malleus) attaches to the center of the membrane and receives vibrations, transmitting them to other bones (the incus and stapes) and the inner ear fluid, and finally to nerves in the brain where sound is perceived. The middle ear is connected to the nose by the eustachian tube, a narrow channel that runs from the ear drum to the back of the throat. In addition to conducting sound, the eardrum also protects the middle ear from bacteria and possible infection. When perforation occurs, bacteria can pass more easily into the middle ear, potentially causing ear infections. Perforation is most commonly caused by either chronic or acute infection of the middle ear, usually related to infection of the nose and throat (nasopharynx). It may also be the result of trauma from direct injury, pressure, or loud noise. In general, the larger the opening in the eardrum, the greater the potential for temporary hearing loss. The location of the perforation also affects the degree of hearing loss. Severe hearing loss may follow a skull fracture that disrupts the bones in the middle ear. Eardrum perforation caused by a loud noise may result in disturbing ear noise (tinnitus) as well as a temporary hearing loss. Tinnitus usually fades in a few days and, over time, hearing loss improves. Perforated eardrum occurs commonly in people of all ages; it is especially common in early childhood when children are exposed regularly to colds and upper respiratory infections in their contact with other children. Middle ear infection, the most frequent cause of perforated eardrum, is the most prevalent reported illness in children between six months and 20 months of age. Middle ear infection ( otitis media ) is the most common cause of perforation of the eardrum. Infection usually stems from an upper respiratory infection in which swelling (edema) in the eustachian tube causes fluid and mucous to gather behind the eardrum. Bacteria that find their way from the nasopharynx into the built up fluid may cause a middle ear infection. The resulting congestion builds up pressure behind the eardrum, causing severe pain and spontaneous rupture, which reduces the pain immediately. Infected or bloody mucus may then drain from the ear. In some cases, the doctor may decide to rupture the membrane on purpose, making an incision ( myringotomy ) that relives pressure, reduces pain, and allows the infection to drain. Chronic middle ear infections can also erode a hole in the eardrum, which can eventually destroy the tiny bones of the middle ear and increase the likelihood of infected material passing from the nasopharynx into the middle ear, causing more infections. Symptoms may include an earache or severe pain in the ear or a sudden decrease in ear pain followed by drainage of clear, bloody, or pus-filled fluid. Hearing loss may be the first symptom experienced, either immediate or delayed, but will usually be restored. Tinnitus may occur as buzzing, swishing, or ringing, which will typically subside after a few days. Rarely, a small hole may remain in the eardrum after a pressure-equalizing tube (tympanostomy tube) falls out or is removed by a doctor. Tympanostomy tube insertion can also cause perforation. If a child with a cold or upper respiratory infection cries constantly or complains of pain in the ear, it is wise to have the ears checked by a physician. Likewise, if the child seems to have pain or difficulty hearing after any type of trauma to the ear (injury with a foreign object, a bang or slap to the head, exposure to extremely loud noise, or after recent air travel), the doctor should be consulted. Early treatment of ear infection may help avoid perforation or hearing loss. A perforated eardrum is a hole or rupture in the eardrum, the thin membrane that separates the outer ear canal from the middle ear. It may result in temporary hearing loss and occasional discharge. if the same organism is responsible for an upper respiratory infection. MRI or CT imaging studies may be done to rule out skull fracture, middle ear tumor, or acoustic neuroma, which may cause pain and hearing loss and be confused with a possible perforated eardrum. Treatment of a perforated eardrum is aimed at relieving pain or pressure behind the eardrum, treating any infection of the ear itself or of the upper respiratory tract, and restoring hearing. Antibiotics are usually the treatment of choice for existing ear infection or to prevent infection and reduce the likelihood of recurrence. Painkillers can relieve associated ear pain. Sometimes the doctor may lance a bulging eardrum and place a tympanostomy tube in it to relieve pain and pressure and allow the ear infection to drain before spontaneous rupture occurs. A perforated eardrum usually heals by itself within two months. Sometimes, a paper patch is placed over the eardrum until the membrane heals. Three or four patches may be needed before the perforation closes completely. If the eardrum does not heal on its own, surgical repair (tympanoplasty) may be necessary to resolve the infection and restore hearing. The ear should be kept clean and dry while the eardrum heals; it may help to insert ear plugs into the ears when showering or shampooing to block any water from getting in. (Cotton balls are not advised because they actually help moisture get into the ear through a wicking effect.) Pain in the ear may be eased by applying warm compresses. While a perforated eardrum may be uncomfortable, it usually heals on its own within two months. Any hearing loss or ear noise that accompanies the perforation is usually temporary. A perforated eardrum can be prevented by avoiding insertion of any object into the ear to clean it or to remove ear wax (cerumen). Excess cerumen should only be removed by a doctor. If a foreign object becomes lodged in the ear, only a doctor should try to remove it. Preventing ear infection is the primary way to prevent a perforated eardrum. Because infection-causing bacteria are found in the ears, nose, and throat in most cases (65-75%) of middle ear infection, avoiding contact as much as possible with children or adults who have colds or upper respiratory infections is one way to reduce the occurrence of infections in children that may lead to middle ear infection. School-age children are especially susceptible to repeat infections. Promptly treating all nose and throat infections will help avoid ear infections. Early treatment of ear infection is another way to guard against a ruptured eardrum and associated hearing loss. Parents will likely be concerned about the possibility of ear infection, especially in children who have already had ear infections. It may help to be especially watchful for symptoms of colds, sinus infections, and upper respiratory symptoms that may lead to ear infection. Physicians may recommend immune system boosters to help prevent infection. Parents can also make sure the child is getting proper rest and nutrition to increase resistance to the common cold and infections present in other children with whom their child plays or attends school. Tinnitus —A noise, ranging from faint ringing or thumping to roaring, that originates in the ear not in the environment. See also Otitis media (middle ear infection) . Gordon, Sharon. Earaches. Danbury, CT: Scholastic Library Publishing, 2003. Lanksy, Vicki. Koko Bear's Big Earache: Preparing Your Child for Ear Tube Surgery. Minnetonka, MN: Book Peddlers, 2004. Menner, Albert L. A Pocket Guide to the Ear. Temecula, CA: Textbook Publishers, 2003. Royston, Angela. Healthy Eyes and Ears. Minneapolis, MN: Sagebrush Education Resources, 2003. American Academy of Otolaryngology—Head and Neck Surgery, Inc. One Prince St., Alexandria VA 22314-3357. Web site: http://www.entnet.org. Better Hearing Institute. 515 King Street, Suite 420, Alexandria, VA 22314. Web site: http://www.betterhearing.org/. "Perforated Eardrum (Tympanic Membrane Perforation)." Ear, Nose, & Throat Center. Available online at http://www.entcenter.net/I_a_eae.htm (accessed October 13, 2004).